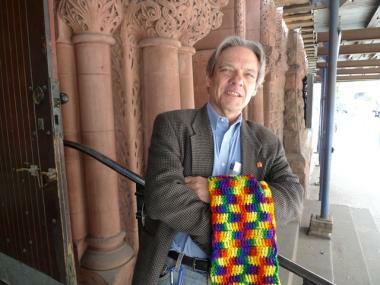 Pastor Bob Brashear of West-Park Presbyterian, with the rainbow stole he once wore at national church meetings to symbolize gays and lesbians who couldn't be ordained. UPPER WEST SIDE — There's been a rainbow hanging beside the Christian flag in West-Park Presbyterian Church for 33 years — but national church leaders took until this week to catch up with the Upper West Side place of worship. On Tuesday, after decades of debate, the Presbyterian Church's national body voted to allow the ordination of openly gay clergy. What most Upper West Siders probably don't know is that West-Park Presbyterian's early leadership paved the way for this watershed moment. In 1978, West-Park was the first Presbyterian church to publicly support welcoming gays and lesbians as church leaders, said Pastor Bob Brashear. West-Park's statement sparked a national movement that gradually saw hundreds of congregations following suit in welcoming gays and lesbians. 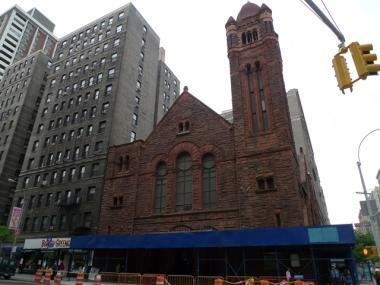 West-Park Presbyterian at West 86th and Amsterdam Avenue. But at the time, West-Park members didn't mean to start a crusade. As then West-Park church member Alice Hudson remembers it, she was motivated by simple anger. When news broke in 1978 that the national church body had rejected e leadership roles for gays and lesbians, Hudson, now 63, said she was "infuriated." "I felt that if anyone proclaims to be a Christian and a person of faith, nobody has the right to tell them you can't come into our church's doors," Hudson said. "I was glad to step in and be part of the battle." Hudson, then a member of West-Park's leadership, fired off what she called a "radical" statement supporting gays and lesbians. After a few edits, West-Park released a toned down version. Church member Bob Arnold says the less heated language was probably the key to the movement's success, because other churches felt comfortable adopting West-Park's stance. The statement offered gays and lesbians what's called "full inclusion" in church life, meaning that they could become clergy, deacons or elders. "This local congregation will not select one particular element from a person's total humanity as a basis for denying full participation and service in the body of Christ," the church's statement read. The concept was modeled after Jesus Christ's message of love and openness, said church member Hope DeRogatis. "Jesus wasn't hanging out with the hoi polloi," DeRogatis said. "He was hanging out with people who were discarded by the structures of power at the time." Hudson said West-Park's actions were inspired by a charismatic pastor, Bob Davidson, who took an interest in the issue in part because he had a daughter who was a lesbian. But West-Park had another motivation for welcoming gays and lesbians — "selfishness," Arnold said. "We wanted to increase our membership and enhance the variety of our membership," Arnold said. "We knew there was a big gay and lesbian population in the community." Urban renewal on the Upper West Side in the 1950s had torn down scores of buildings, and displaced thousands of families. Many of them were West-Park members, Arnold said. Formally welcoming gays had an immediate impact, Hudson remembers. Within days of issuing the statement of support, a group of gay men established a discussion group at West-Park, she said. Gay people began driving from as far as 40 miles away to worship at West-Park, said Pastor Bob Brashear. 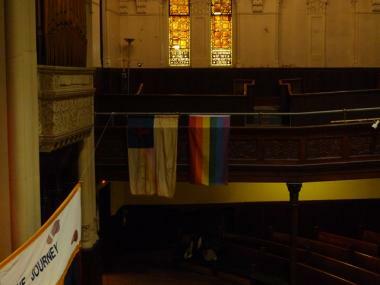 A rainbow flag has hung side by side with the Christian flag at West-Park Presbyterian for 33 years. The congregation grew, and as the AIDS epidemic dawned in the 1980s, West-Park became a safe haven for a decimated gay community, DeRogatis recalled. She remembers it as a time of "vilification" and "rejection" for gays. DeRogatis, a nurse, remembers doctors who were afraid to treat AIDS patients. "There was nothing but sorrow, nothing but pain, but the congregation had been prepared to welcome people, even when they weren't being welcomed in our culture," said DeRogatis. "To me that was God at work, making the congregation open to gay people during the AIDS epidemic." Brashear, who came to West-Park in 1995, said he was inspired to join the church in part because of its stance on gays and lesbians. Brashear had a close friend at divinity school who was gay, and couldn't be ordained because of his sexual orientation. "He's been waiting 33 years to have the same rights I do," Brashear said. Today, that same welcoming spirit informs West-Park's work, Brashear said. "It's a legacy of welcome and affirmation that continues to be at the base of where we want to be," he said. "It remains a challenge to see where exclusion still exists in our society and to push the boundaries of that."